Someone really threw you a major effort for your first model. Good Luck !! When I opened your model, it said that you wall in question has a negative net Area. That means you created windows/doors, etc with surface areas that exceed the wall you placed it on. Try reducing your window and door area to have an area less than the wall area. I am sure the wall will then pop up. 1) Make your background white.Go to the Component tree, left click on Project (all the way at the top). Go to the right tab marked "3-D View Details". Go to "Background" Color, and change to White. Close. Click on 2-D Geometry. Then try #-D Geometry. Viola !! A LOT easier to see building components. Let there be Light !! 2) Name ALL of your Spaces in Building Shell and All of your HVAC Zones in Air Side (except Plenums). Now you will never lose your place. Walls and Windows don't need to be named, unless you have a specific architectural EEM you might be changing. Newbie Disclaimer - As mentioned before, this is my first stab at an energy model and it is a 6 story hospital. I have finished the wizard mode and entered doors and windows in detailed mode. 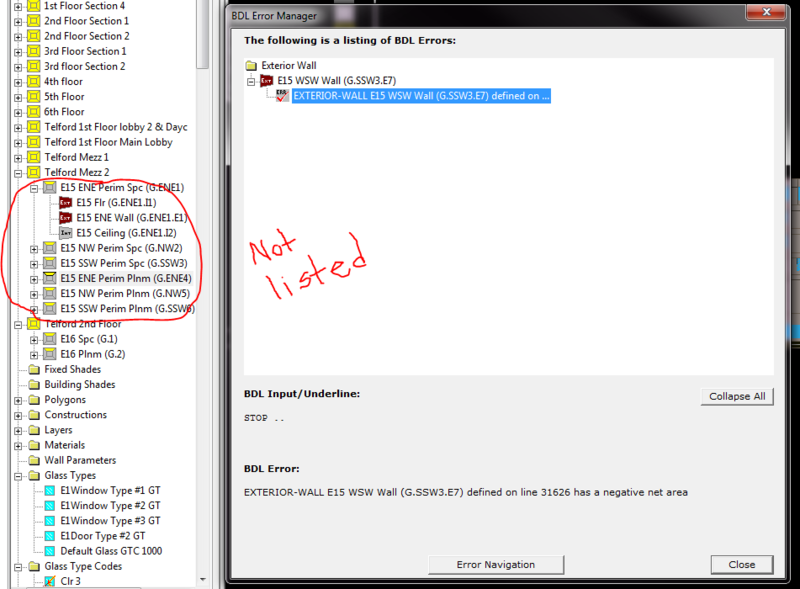 I was showing 0 BDL errors but now am showing one for an exterior wall that I can't seem to locate. I am attaching all files and would greatly appreciate any help resolving Exterior Wall error and why I get "Error:  1 standard file writing errors encountered." when I try to run simulation. Plug Smart is accepting new clients,the best praise you could give us a recommendation to a potential new client.Everyone needs to save money, Plug Smart can make it happen. Confidential:This e-mail and any files transmittedwith it are the property of Juice Technologies, LLC. and/or its affiliates, areconfidential, and are intended solely for the use of the individual or entityto whom this e-mail is addressed. If you are not one of the named recipients orotherwise have reason to believe that you have received this e-mail in error,please notify the sender and delete this message immediately from yourcomputer. Any other use, retention, dissemination, forwarding, printing orcopying of this e-mail is strictly prohibited.